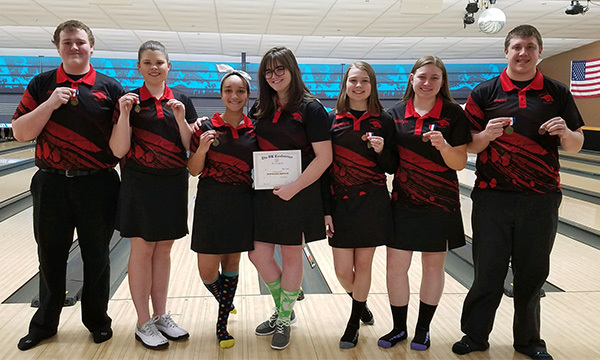 Tag Archive | "OK White conference"
Red Hawk girls bowlers are OK-White conference champs. L to R: Coach Tim Jackson, Alexa Thompson, Rose Baty, Omani Morales, Katelyn Paige, Michayla Paige,Sarah Galloway and Asst. Coach Crystal Morales. 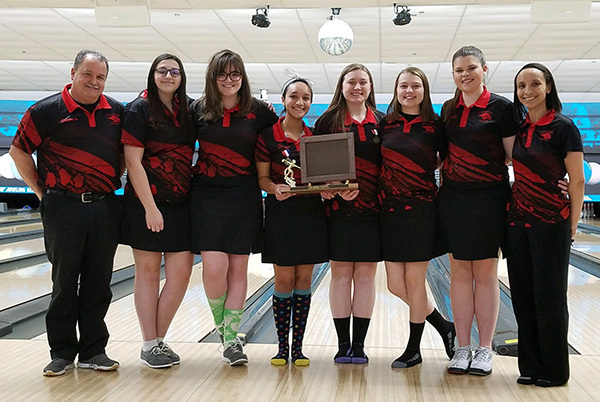 It’s been a great year for Cedar Springs bowling teams, and the girls are OK-White conference champions for the second year in a row. In the days leading up to the conference tournament, the teams bowled a couple of conference matches. On February 13 the teams had a conference match against Forest Hills Northern at Eastbrook Lanes. The girls won their match and boys lost. 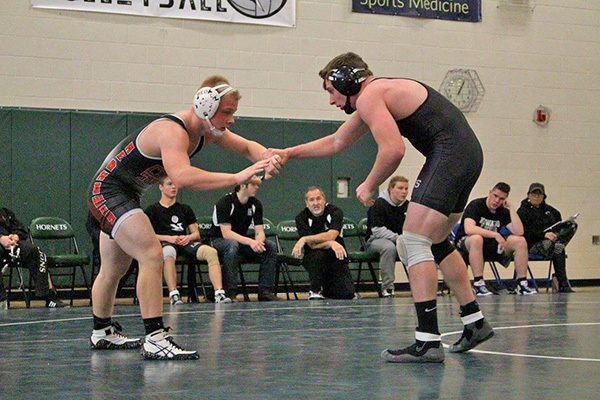 On February 14, they had a conference match against Forest Hill Central at Rockford. The girls won and the boys lost. On February 16, the teams bowled in their conference tournament, hosted by Lowell, at Ionia lanes. The Red Hawk girls carried the day and walked away as back to back OK-White Conference Champions! They were undefeated. Red Hawk all-conference bowlers. L to Right Josh Beebe, Sarah Galloway, Omani Morales, Rose Baty, Michayla Paige, Katelyn Paige and Dane Conley. Two of the boys made all conference: Joshua Beebe was 5th with a 183.1 average and Dane Conely 6th with a 182.8 average. Four girls made all-conference: Omani Morales was 1st with a 201 average; Sarah Galloway 2nd with a 173.1 average; Katelyn Paige 3rd with a 172.5 average; and Michayla Paige 6th with a 158.4 average. Rose Baty made honorable mention with a 140.4 average. On February 17, the girls and boys attended a singles Regional Tune-up. There were 91 boys and 49 girls bowling. Unfortunately, no Red Hawk boys made the 12-spot cut. Three girls made the cut with Omani Morales placing 3rd, Katelyn Paige 6th, and Michayla Paige 11th. Unfortunately Katelyn and Michayla were eliminated in the second round. Omani made it to the 3rd round but was eliminated. While she didn’t make the cut, Rose Baty bowled her high school high game of 236. The girls will now travel to regionals Friday and Saturday February 22-23 in Muskegon. Thursday, August 24, marks the first game of the 2017 season for the Cedar Springs Red Hawks, and you don’t want to miss it! 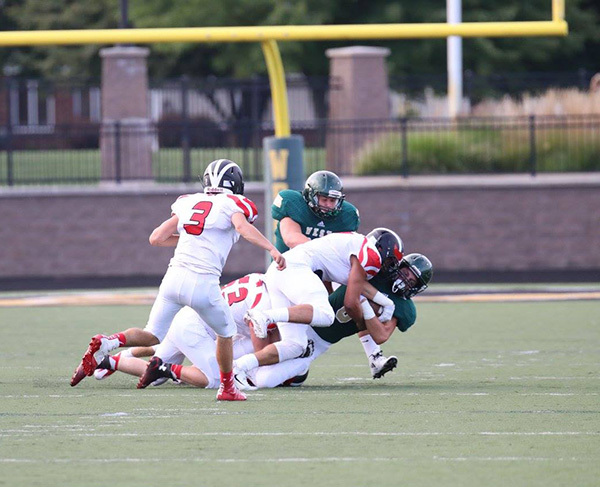 They face off against Zeeland West, at Red Hawk Stadium at 7 p.m.
Last year the Red Hawks moved into the OK White conference after the OK Bronze was dissolved, and went 3-3 in conference, 4-5 overall. They will face some tough competitors in the OK White, including Lowell, Forest Hills Central, Forest Hills Northern, and Greenville. Their first three games are home, and the first two are non-conference games. 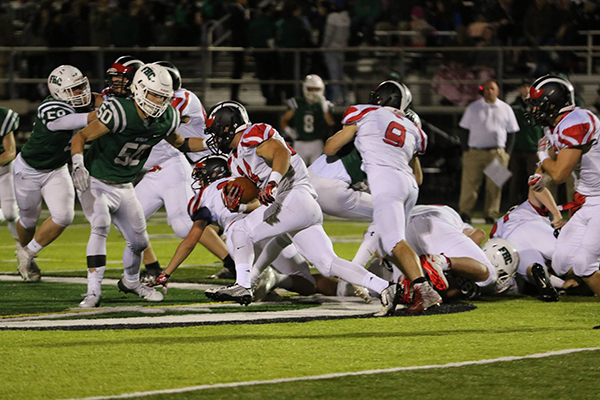 They will face Zeeland West tonight (Thursday, August 25), Battle Creek Lakeview on Thursday, August 31, and Greenville on Friday, August 8. 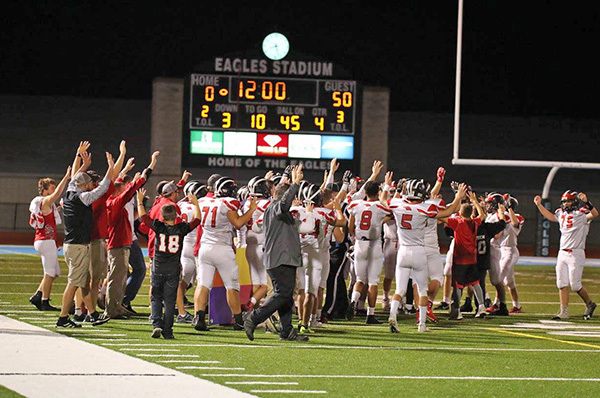 All games are at 7 p.m.
Come on out and cheer on your Cedar Springs Red Hawks and see the brand new turf on the playing field! 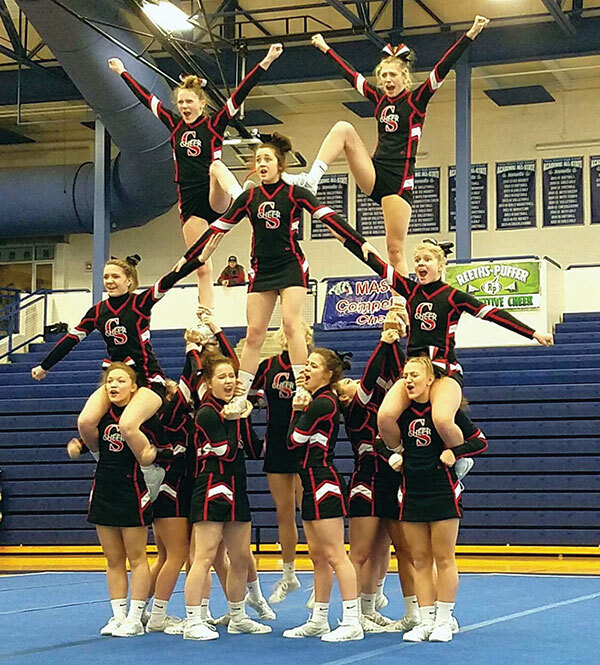 Cedar Springs Varsity Cheer team takes first place at the second OK White Conference meet. 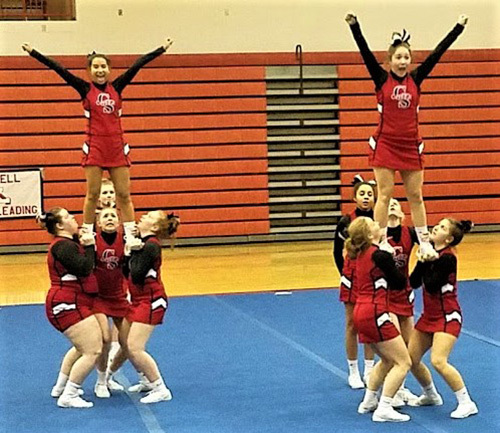 Cedar Springs JV Cheer team earned their highest score of the season. 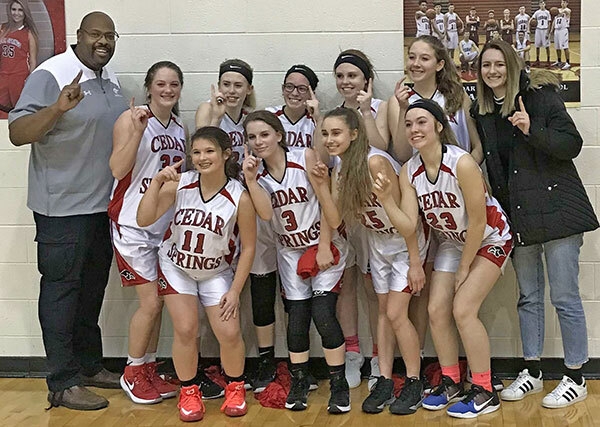 On Wednesday, January 25, Cedar Springs High School hosted the second OK White Conference meet of the season. 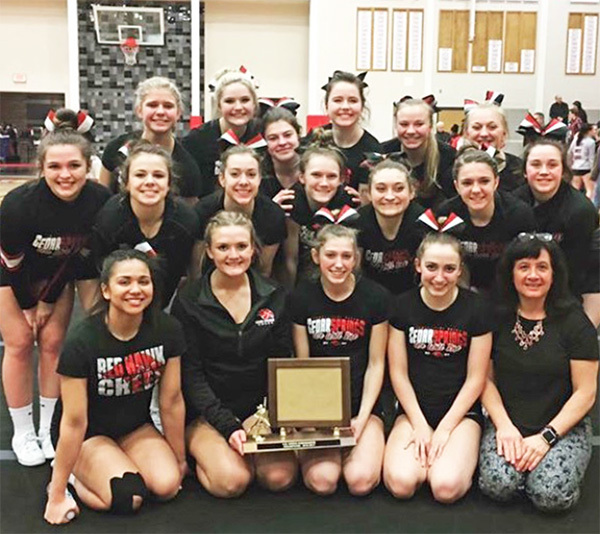 Since Cedar Springs JV is the only JV team in the OK White Conference, they have one goal set for each conference meet—to beat their own high score. On Wednesday they did just that. At the end of round 1, Cedar Springs JV received a score 193.7; round 2 brought them a score of 165.8 and a subtotal score of 359.5; at the completion of round 3 they earned an additional 260.4 and a total score of 619.9, their highest scores of the season. There are four teams competing at the Varsity level for OK White Conference Champs. 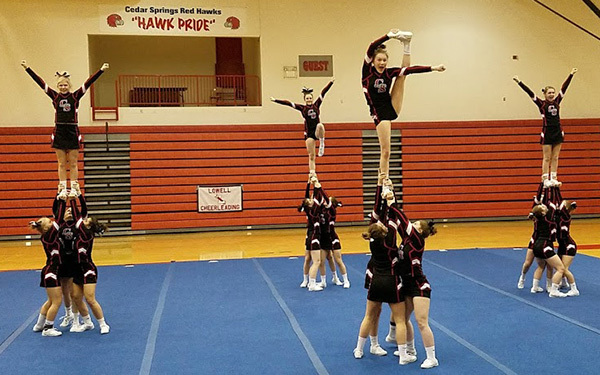 After round 1, Cedar Springs Varsity took the lead with a score of 226.7 and less than a one-point lead. Round 2 gained an additional 222.3, a subtotal score of 449 and almost a 14-point lead. At the completion of round 3 they earned a score of 303 and a final score of 752, securing their first place finish with a 20-point lead. Saturday, January 28, the JV and Varsity teams traveled to East Kentwood High School for the LMCCOA Scholarship Invitational. Nine teams competed at the JV level. In round 1 they earned a score of 169.5. In round 2, they gained an additional 156.98, bringing their subtotal to 326.48. They gained an additional 245.9 points in round 3, giving them a final score of 572.38 and a fifth place finish. Thirteen teams competed in the D2 Varsity division. Round 1 earned Cedar Springs a score of 224.7. They gained an additional 221.64 in round 2, bringing them a subtotal score of 446.34. The completion of round 3 gained them an additional 288.2 points, a total score of 734.54 and a fourth place finish. 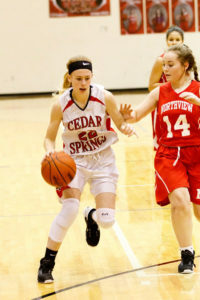 On Saturday, February 4, Cedar Springs JV and Varsity will travel to Southgate on the east side of the state to compete at the Southgate Anderson Invitational.